Are you looking for a wall light in glass? Look at this wall light bathroom 620mm wide for T5 lamp! This wall light is very nice and practical! 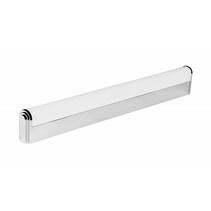 Does this wall light bathroom 620mm wide for T5 lamp fit in your interior? Continue reading then. 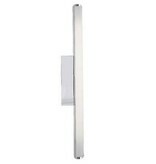 This wall light bathroom 620mm wide for T5 lamp is made in aluminium and finished in chroom. It has a light cover in polycarbonate. The fitting is G5 and is made for a T5 lamp. T5 is a small fluorescent lamp (also called TL) and is the small variant of the T8 TL. 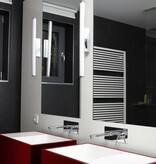 The T5 lamp of 14W is not included in this wall light bathroom 620mm wide for T5 lamp. This wall light bathroom 620mm wide for T5 lamp is perfect to use as bath room lighting or kitchen lighting! In addition that this wall light bathroom 620mm wide for T5 lamp is useful as bathroom lighting, we guarantee a good after sales service. You will be informed about the status of your order. After payment, we treat your order. Once that the wall light bathroom 620mm wide for T5 lamp is in stock, we will inform you about your order. Do you have more questions? Do not hesitate to contact us by phone (+32) 57 466 866 or by mail (info@myplanetled.com) in order to gather more information about this wall light bathroom 620mm wide for T5 lamp.